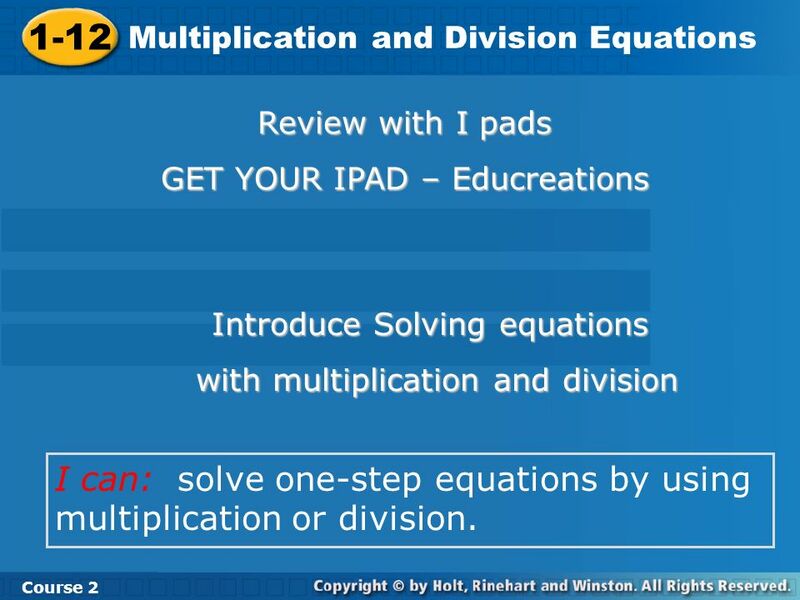 1 1-12 Multiplication and Division Equations Course 2 Review with I pads GET YOUR IPAD – Educreations Introduce Solving equations with multiplication and division I can: solve one-step equations by using multiplication or division. 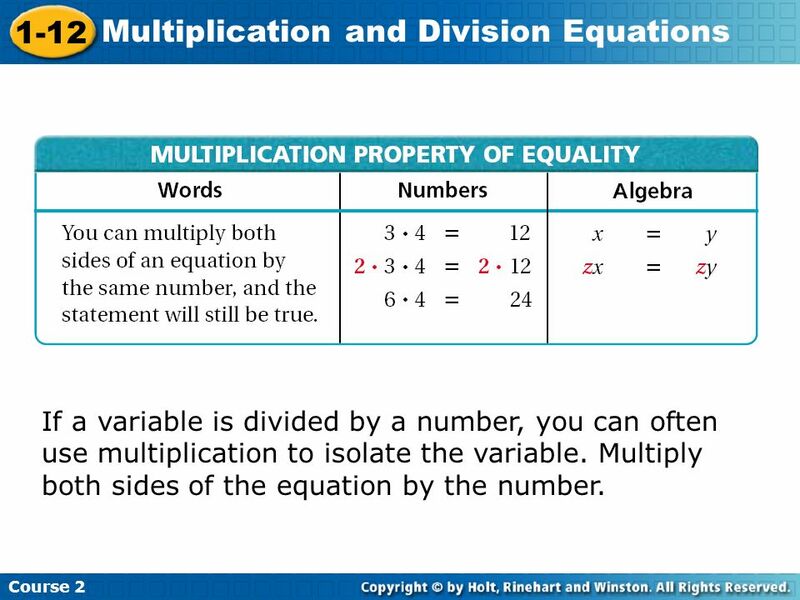 3 If a variable is divided by a number, you can often use multiplication to isolate the variable. Multiply both sides of the equation by the number. 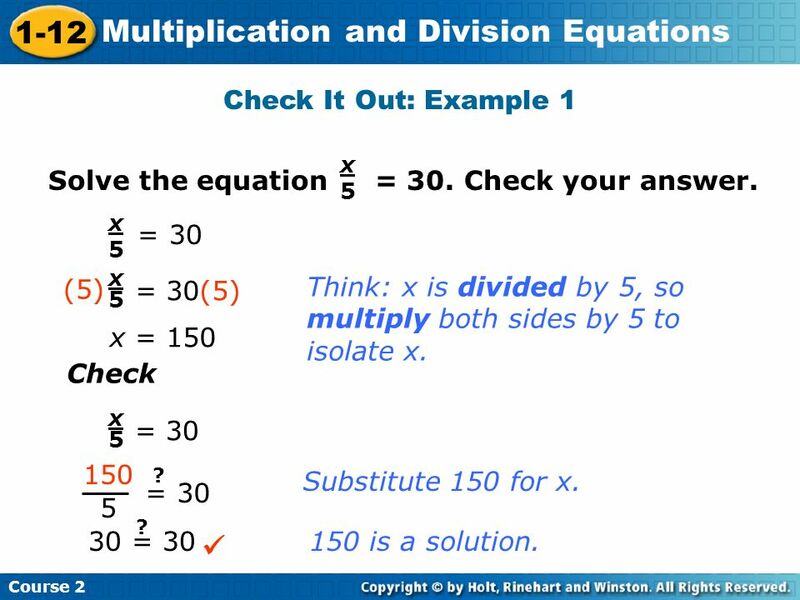 5  Check It Out: Example 1 Solve the equation = 30. Check your answer. 5 Solve the equation = 30. Check your answer. x 5 = 30 x 5 (5) = 30(5) Think: x is divided by 5, so multiply both sides by 5 to isolate x. x = 150 Check x 5 = 30 150 5 ? = 30 Substitute 150 for x. 30 = 30 ?  150 is a solution. 6 You cannot divide by 0. Remember! 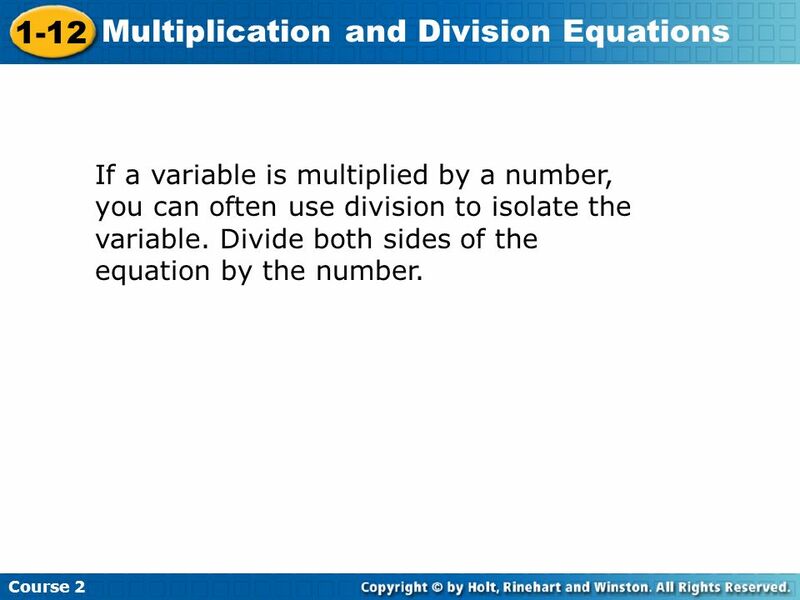 7 If a variable is multiplied by a number, you can often use division to isolate the variable. Divide both sides of the equation by the number. Solve the equation 51 = 17x. Check your answer. 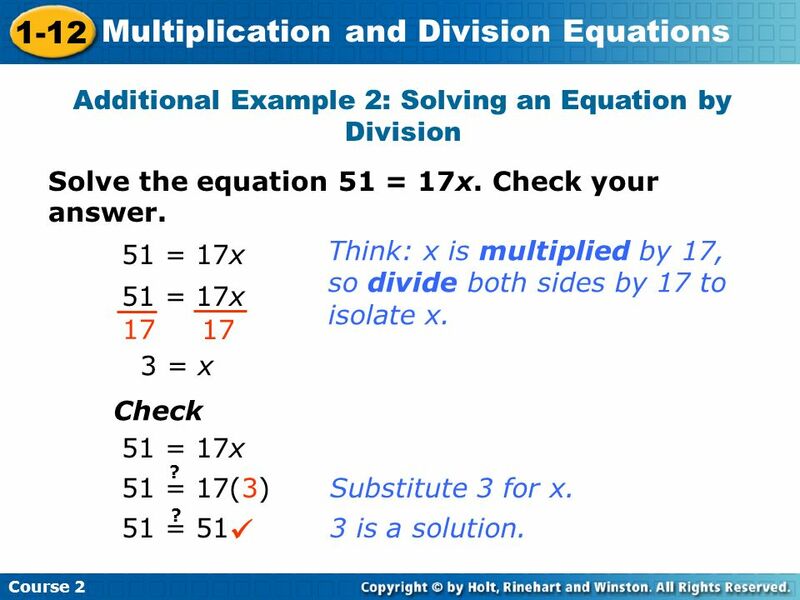 51 = 17x Think: x is multiplied by 17, so divide both sides by 17 to isolate x. 51 = 17x 17 17 3 = x Check 51 = 17x 51 = 17(3) ? 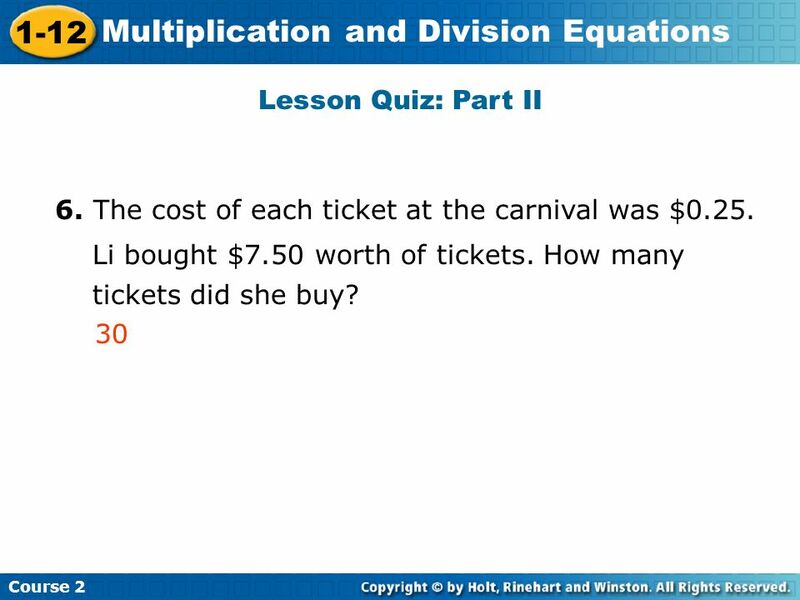 Substitute 3 for x. 51 = 51 ?  3 is a solution. 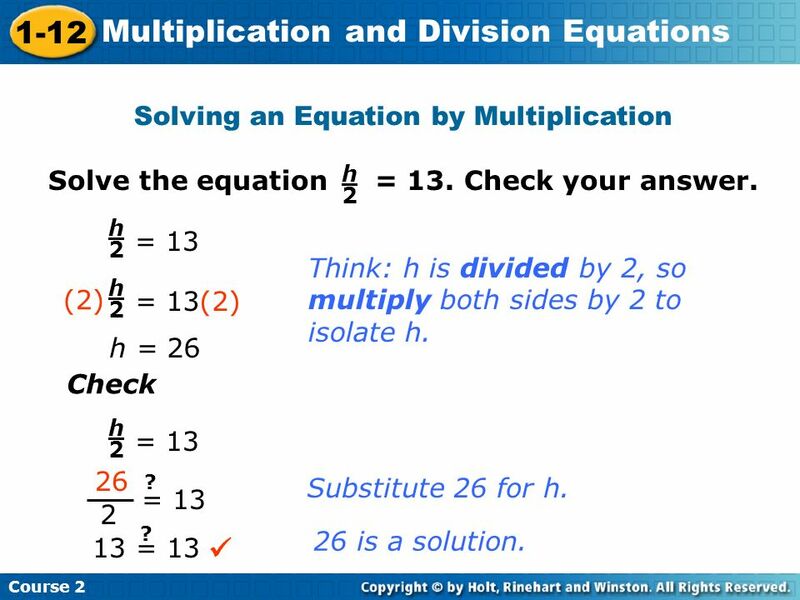 9 Check It Out: Example 2 Solve the equation 76 = 19y. Check your answer. 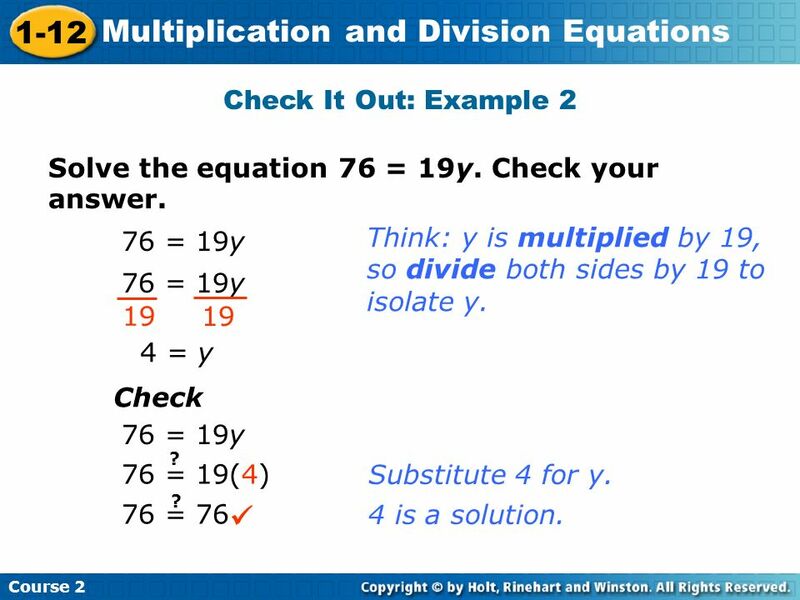 76 = 19y Think: y is multiplied by 19, so divide both sides by 19 to isolate y. 76 = 19y 19 19 4 = y Check 76 = 19y 76 = 19(4) ? Substitute 4 for y. 76 = 76 ?  4 is a solution. 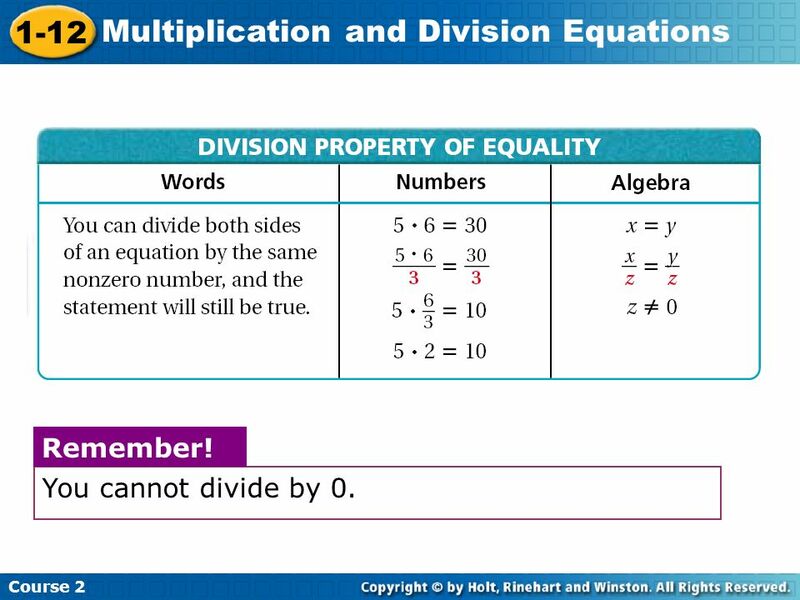 10 I can: solve one-step equations by using multiplication or division. 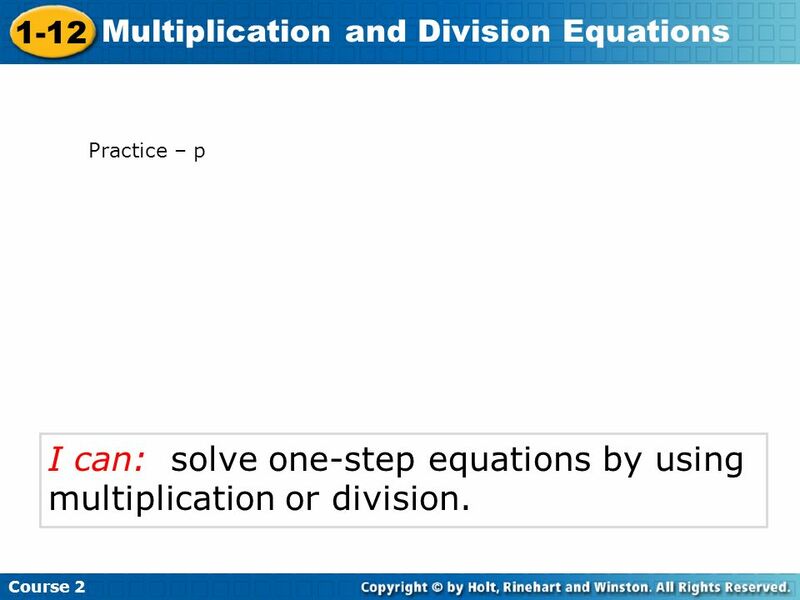 Practice – p I can: solve one-step equations by using multiplication or division. Trevor’s heart rate is 78 beats per minute. How many times does his heart beat in 10 seconds? 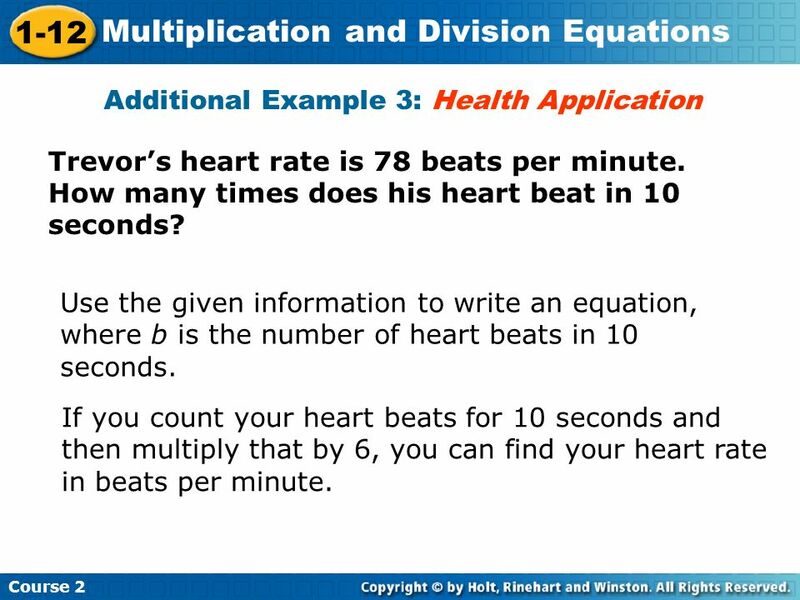 Use the given information to write an equation, where b is the number of heart beats in 10 seconds. If you count your heart beats for 10 seconds and then multiply that by 6, you can find your heart rate in beats per minute. 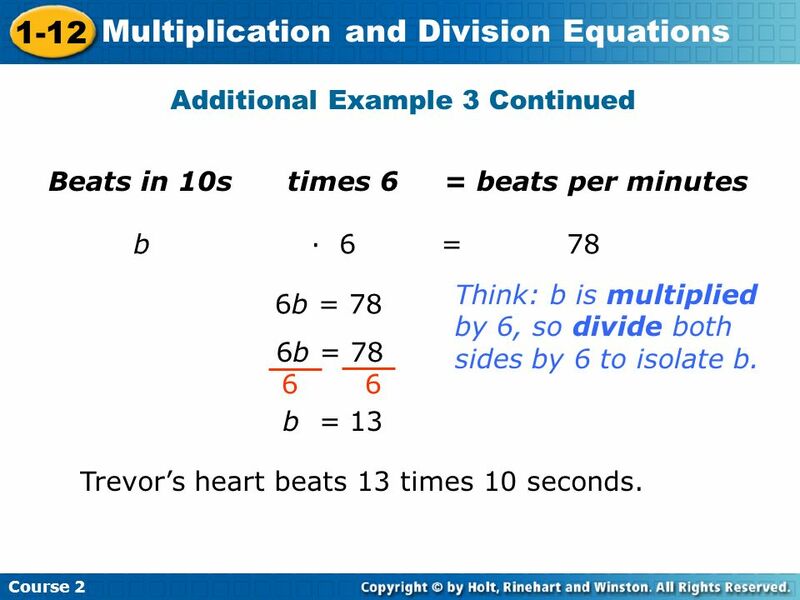 Beats in 10s times = beats per minutes b · = Think: b is multiplied by 6, so divide both sides by 6 to isolate b. 6b = 78 6b = 78 b = 13 Trevor’s heart beats 13 times 10 seconds. 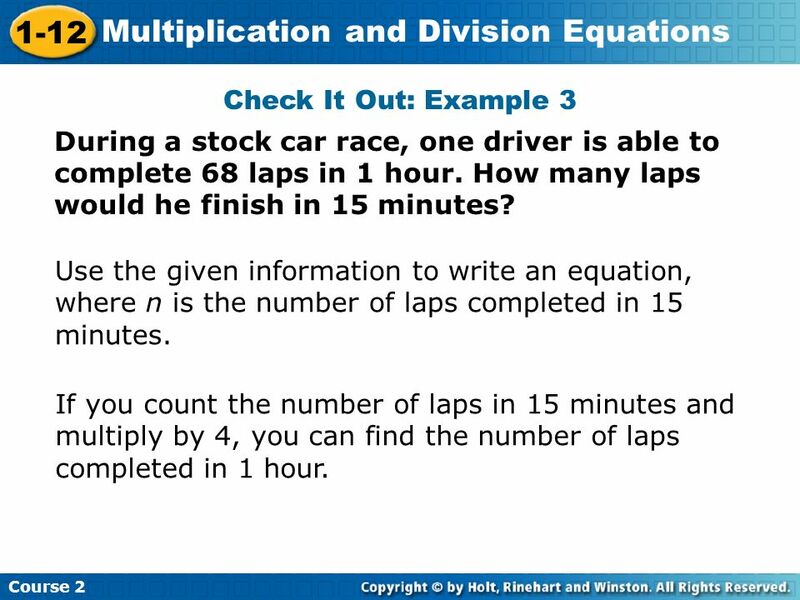 13 Check It Out: Example 3 During a stock car race, one driver is able to complete 68 laps in 1 hour. How many laps would he finish in 15 minutes? 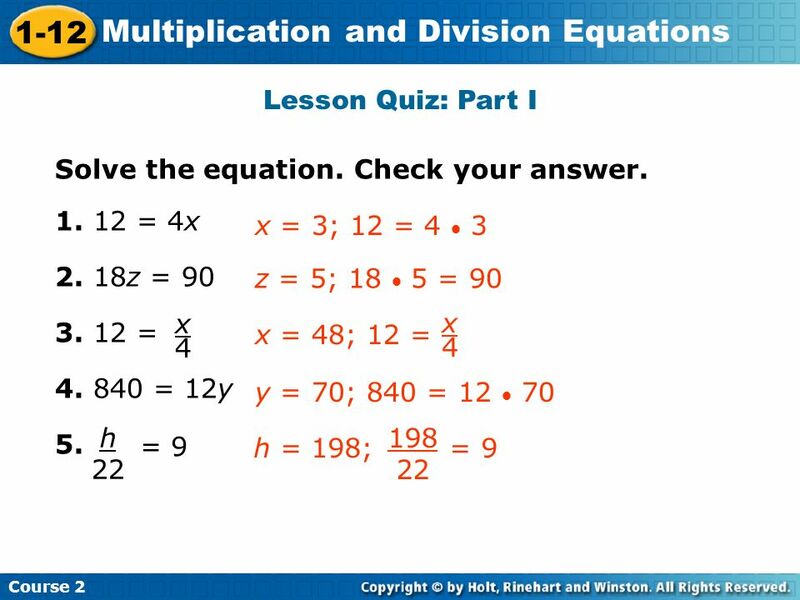 Use the given information to write an equation, where n is the number of laps completed in 15 minutes. If you count the number of laps in 15 minutes and multiply by 4, you can find the number of laps completed in 1 hour. 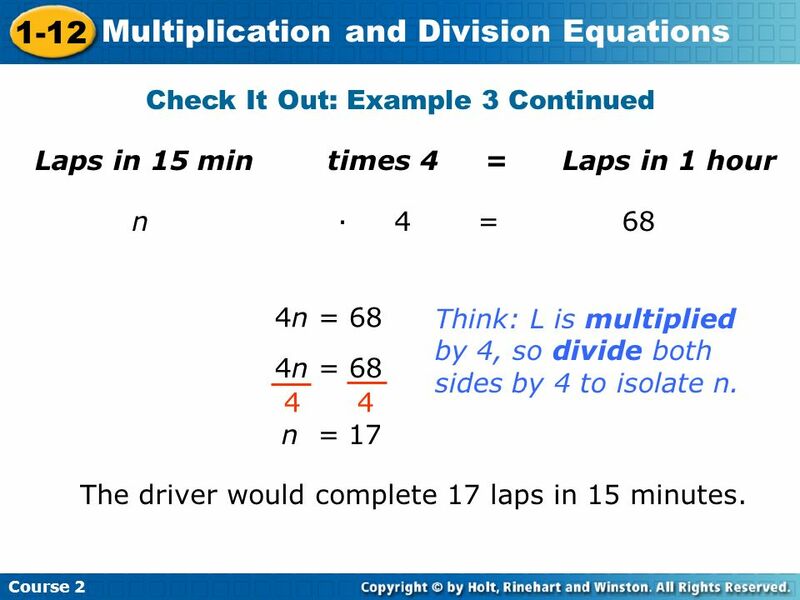 Laps in 15 min times = Laps in 1 hour n · = 4n = 68 Think: L is multiplied by 4, so divide both sides by 4 to isolate n. 4n = 68 n = 17 The driver would complete 17 laps in 15 minutes. 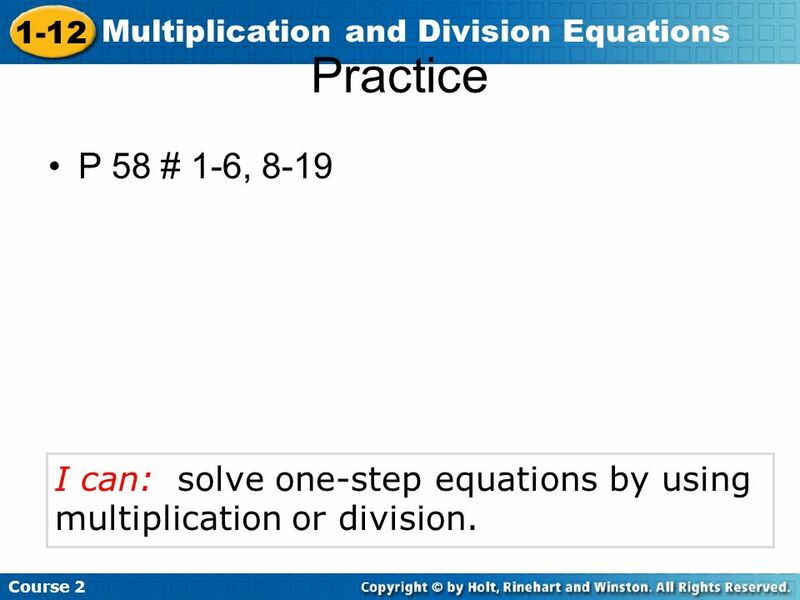 16 Practice P 58 # 1-6, 8-19 I can: solve one-step equations by using multiplication or division. 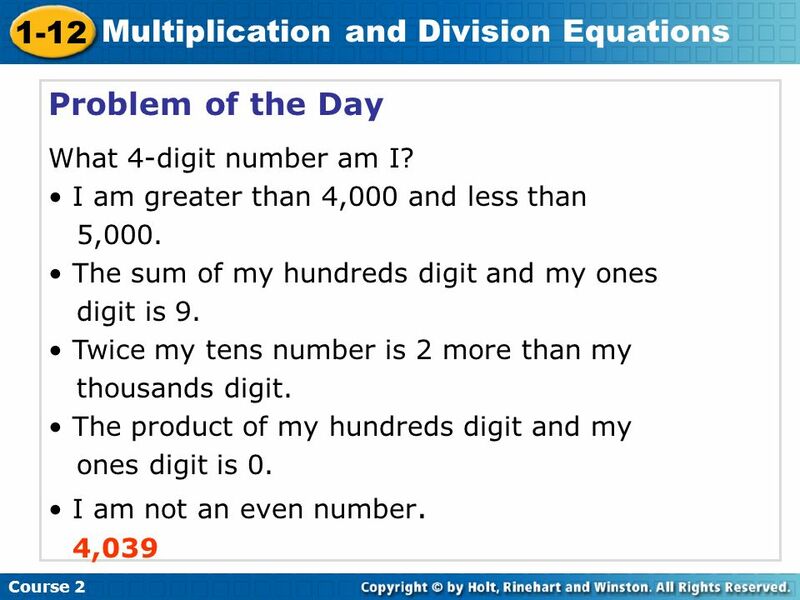 18 Problem of the Day What 4-digit number am I? 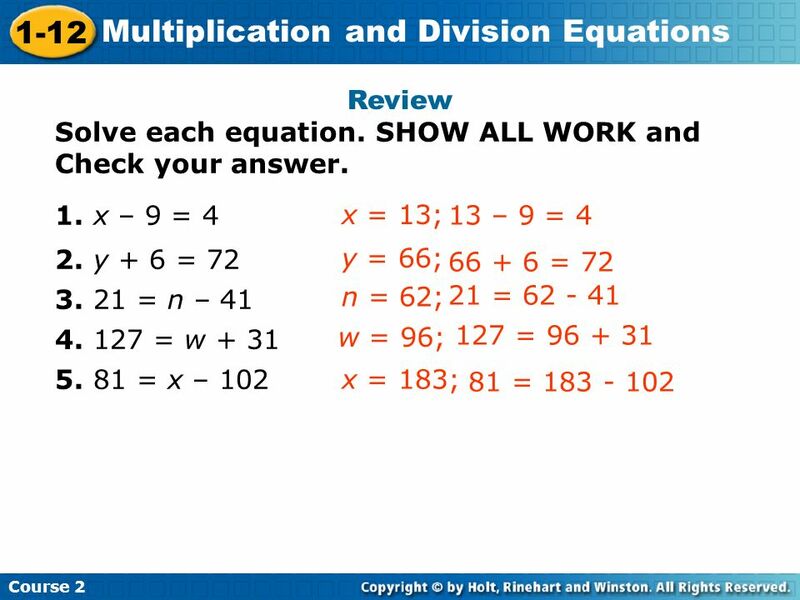 Download ppt "1-12 Multiplication and Division Equations Course 2 Review with I pads"
C) between 18 and 27. D) between 27 and 50. 3. Side = x + 5 P = 3(side) P = 3(x + 5) P = 3x Side = 2x – 1 P = 4(side) P = 4(2x – 1) P = 8x – 4 5. Side = 2x + 3 P = 5(side) P = 5(2x + 3) P.
3. Side = x + 5 P = 3(side) P = 3(x + 5) P = 3x + 15 4. Side = 2x – 1 P = 4(side) P = 4(2x – 1) P = 8x – 4 5. Side = 2x + 3 P = 5(side) P = 5(2x + 3) P.